On Sunday Oct. 28, I ventured out of my culinary comfort zone to a restaurant called the Market On South, located in Orlando’s Milk District. Contrary to its location, the Market On South is completely dairy free and vegan. Their menu features plant-based beverages and dishes, with options ranging from authentic BBQ meals to traditional desserts. I walked into the restaurant attempting to stay as optimistic as possible despite my apprehensions to vegan foods. 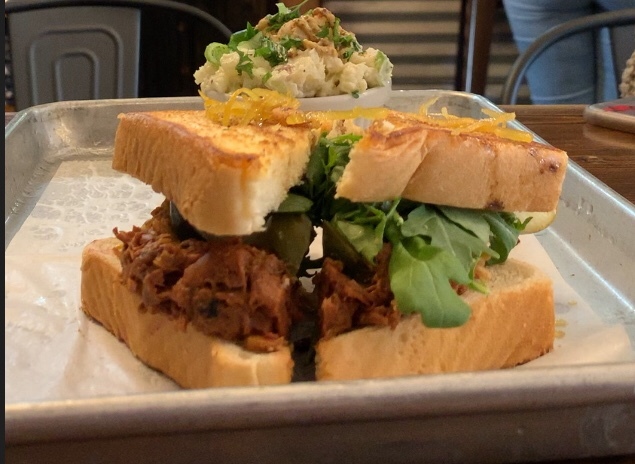 Now I have to admit, as a devoted meat eater, I was a bit skeptical that any vegetable or fruit could replace one of my favorite American classics – a barbeque pulled pork sandwich. I typically do not consider myself a picky eater but a foods texture can make it a hit or miss. The thought that some plant could match the tenderness and juiciness of a pulled pork sandwich seemed nothing short of outrageous. While I waited for my “Carolina BBQ Pulled Jackfruit” sandwich to arrive, I observed the decorations and souvenirs that the Market On South had to offer, while drinking from a paper straw embellished with adorable flamingos. These factors aided in distracting me from my aversion to a non-pork pulled sandwich. Once the sandwich arrived, the last of my hesitation was quickly diminished by the impressive plating and presentation of the dish. As I took my first bite, I was instantly impressed with the texture of the jackfruit as it was very similar to the consistency of pulled pork. Furthermore, the jackfruit was very sweet, matching in uniform with pulled pork almost perfectly. My only complaint with the dish might be that the fruit was not able to tackle the savory aspect that meat can. With that being said I can most certainly conclude that the jackfruit was a worthy substitution for the beloved classic pulled pork. In essence, I would most definitely visit the Market On South again and strongly encourage others to do so as well.